The daughter of a British woman who is facing prison in Dubai for calling her ex-husband's new wife a "horse" on Facebook has pleaded for her release.Laleh Shahravesh, 55, was arrested at Dubai airport after flying to the city to attend her ex-husband's funeral.Her daughter, Paris, has written to Dubai's ruler saying she has not seen her mother in more than three weeks. 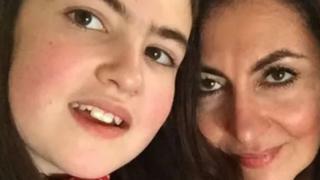 "I ask kindly: please, please return my mother's passport, and let her come home," said the 14-year-old.The Foreign Office said it was supporting mother-of-one Ms Shahravesh. Ms Shahravesh, from Richmond in south-west London, was married to her Portuguese husband Pedro for 18 years, according to campaign group Detained in Dubai which is working to get her released.The couple lived together in Dubai for eight months - where Pedro worked for HSBC - before Ms Shahravesh returned alone to the UK with the couple's daughter. On Monday, an open letter was published online from the couple's daughter, Paris Shahravesh Correia Dos Santos, to the prime minister of the United Arab Emirates, Sheikh Mohammed bin Rashid Al Maktoum, who is also the ruler of Dubai.She claimed that police shouted at her crying mother, who she said was "given no choice" but to sign a document that she did not understand. Paris said: "I cannot emphasise enough how scared I felt, especially after losing my father just a week before, as I was having to worry about losing my mother as well. "Yet even though I felt terrified on the day that we arrived, the sick feeling in my stomach only became worse. "She added: "I have not seen my mother in 23 days, and with every passing day, I feel less hopeful of her return." The chief executive of Detained in Dubai, Radha Stirling, said the complainant has since written on Facebook that she is considering dropping the charges and retracting her statement out of respect for Paris.Earlier, Ms Stirling told BBC News that both her organisation and the Foreign Office (FCO) had asked the complainant to withdraw the allegation, but she had refused.According to Ms Stirling, her client Ms Shahravesh had been bailed but her passport had been confiscated and she was currently living in a hotel. Ms Stirling added that "no-one would really be aware" of the severity of cyber-crime laws in the UAE, and the FCO had failed to adequately warn tourists about them.The FCO said in a statement: "Our staff are supporting a British woman and her family following her detention in the UAE. "We are in contact with the UAE authorities regarding her case. "Meanwhile during a trip to meet EU leaders in Luxembourg, Foreign Secretary Jeremy Hunt told reporters that the government was "concerned" by the situation. "Our diplomats in the UAE have enormous experience in dealing with consular cases as we saw from the Matthew Hedges case and so she is getting the best possible service from the FCO," he said.Durham University PhD student Mr Hedges was pardoned last year after intense diplomatic pressure. He had previously been accused of spying for the UK and jailed for life in an Abu Dhabi court.Ms Shahravesh faces further court proceedings on Thursday. She said: "I am terrified. I can't sleep or eat. I have gone down two dress sizes because of the stress. "And my daughter cries herself to sleep every night. We are so close, especially since her father left us and we only have each other. It breaks my heart to be kept apart from her. "She has previously spoken about her Facebook comments, saying: "I reacted badly. I lashed out and wrote two unpleasant comments about his new wife on his Facebook page."